There’s no doubt about it, the living room is one of the most important rooms in your property rental. An Airbnb living room is the place where your guests can relax after a busy day of sight-seeing, chill out and watch Netflix, or catch up with their nearest and dearest over a glass or four of chilled wine. As a host, it’s your job to ensure your Airbnb living room offers a welcoming space for your guests. Therefore it should provide a high level of comfort, and look genuinely inviting. Keen to make your Airbnb guests feel at home? 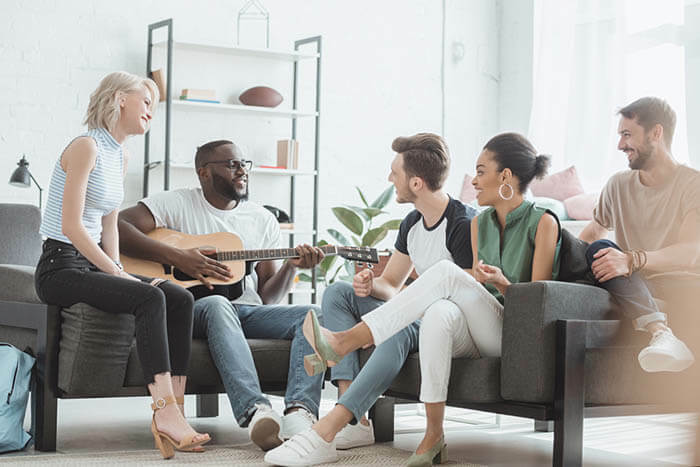 Simply follow our checklist of the top Airbnb living room essentials that will impress your guests and bring you closer to obtaining that coveted Superhost badge you’ve been hankering after! No living room would be complete without a comfy couch and a couple of cozy armchairs, after all, your guests will need somewhere to kick back and relax after their busy day. Arranging the perfect seating area can be a bit of a challenge, so it’s worth giving some serious thought to effective living room zoning (a great way to ensure your home is both comfortable and functional). Try to create a conversation area – a space where guests can congregate to discuss their plans for the forthcoming day. Take into account how much space you have to work with, you don’t want to shoe-horn furniture in! If space is tight choose furniture that won’t take up too much room. Budget constraints should be taken into account too, a couch is certainly classed as essential living room furniture, but you don’t want to spend the earth on it! That said, buying cheap may be tempting – but keep in mind you often get what you pay for. If possible, opt for high-quality seating that has stain-resistant upholstery. Sofas in vacation rentals are naturally prone to wear and tear, therefore investing in stylish slipcovers is a great idea if you want your furniture to last longer. Fancy increasing occupancy numbers in your rental? Adding a pull out sofa bed is an easy way to provide an extra sleeping place in your Airbnb living room. More beds equal more profit, if you accommodate more guests then you can justifiably bump up your nightly rate. Enhance your Airbnb living room further with the addition of a small table. Coffee tables and end tables rank highly on the list of essential living room furniture. Your guests will appreciate having a place to rest their drinks and snacks, and providing a small table discourages guests from popping things on the floor (which can lead to nasty spills and stains). Don’t forget to provide coasters for hot coffee or tea mugs, otherwise, you will have to deal with annoying condensation rings on the surface of your table. Want to go one step further? Organize your living room space even more by investing in a coffee table that has shelving and storage underneath. Then you can add a few books, magazines or maps for your guests to peruse at their leisure. A single central lamp hanging in the middle of the room simply won’t cut it in today’s rental market. Interior designers strongly advise homeowners to mix up different styles of lighting in order to gain maximum impact. Why not give it a shot by combining various lamps and lights in your Airbnb living room? Mixed lighting adds interest to your Airbnb living room – providing shade and highlights. Position a floor lamp in the corner, add some smaller lamps on end tables or place a few lights on the wall. A variety of lighting provides your guests with options, and they can adjust the lighting according to their own preferences. Warm-colored LED-bulbs are a great investment as they help to create a warm, inviting ambiance within the room. However, be careful and don’t overdo it with sharp bright light and blue shades – unless you are keen for your space to resemble a stark industrial workspace or a desolate warehouse. Most guests appreciate having a fast and stable Wifi connection while staying at your place. Some Airbnb guests won’t even consider a brilliantly crafted listing if it doesn’t mention Wifi as an amenity. Guests love to stay connected with their loved ones, or check out the latest episode of their favorite show, and to do that they will require reliable Wifi access. Not every guest wants to be entertained by television, they might not even consider flopping down in front of the gogglebox in your Airbnb living room. However, it’s worth investing in television, as some guests like to have an option of putting their feet up and enjoying a movie etc. It’s worth checking the smart TV options – that way guests have the opportunity to log in to their own Netflix or Hulu accounts. “I want to stay in a soulless, bland, characterless place please,” said no guest ever! Make sure your Airbnb living room doesn’t resemble an uninhabited space by decorating your walls. 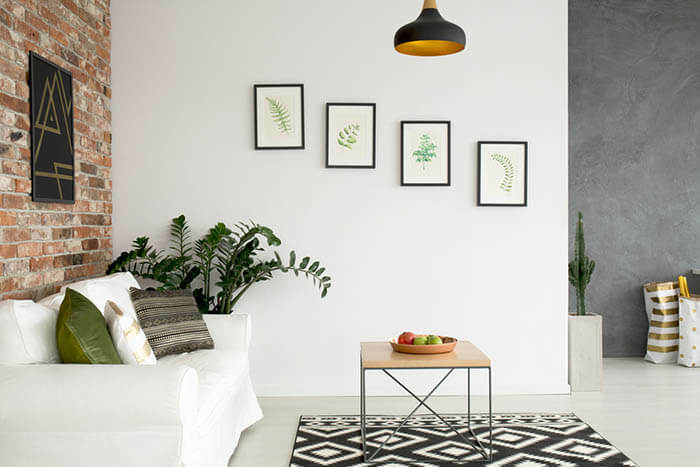 Adding color and pattern to your accommodation can make it look more welcoming, and the good news is your wall décor doesn’t need to be overly expensive. Simply place a couple of nice-looking pictures on the wall or go large and hang oversize, striking wall for a more exclusive look. Create a welcoming atmosphere and elevate your guest experience by adding a few special touches to your Airbnb living room. Cozy throws, pillows, and blankets can add warmth and bare floors can be brightened up by a rug or two. Bring fresh energy into your interior by dotting a few plants around your room (boost oxygen levels at the same time). A little concerned that your plants might not survive without regular watering? Simply opt for a cactus or hardwearing plant. Finally, keep in mind the importance of focusing on your prospective guests. 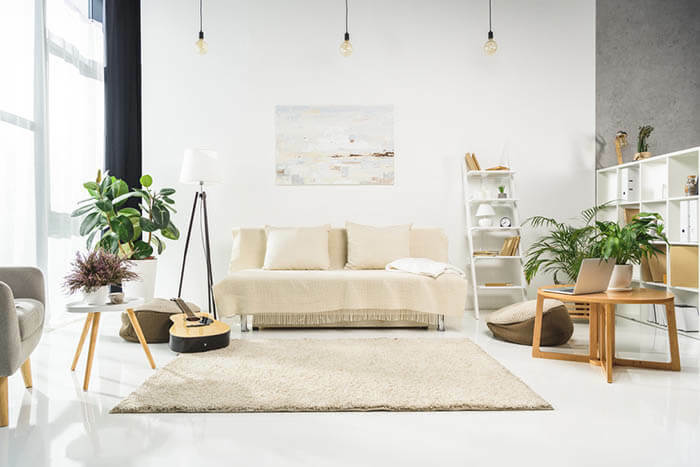 Take time to consider what living room necessities, and essential living room furniture they might like to see in your Airbnb accommodation.